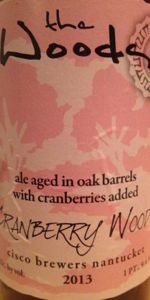 Cranberry Woods | Cisco Brewers Inc.
Cranberry Woods is a sour ale wildly fermented in 500 gallon oak tanks inherited from our sister company, Nantucket Vineyard. This beer is aged for 24 months, with Nantucket grown cranberries, lactobacillus, and brettanomyces. Clear light amber with a shade of pink and a loud medium fizzy head that dies to a light film and thick collar, then nothing. Smell seems strongly acetic, with oak, a little milkiness, and powerful, bright cranberry with a little barnyard funk. Taste is fairly acetic sour and oak, with cranberry all over the place and a little milky lactic acid, but overall very tart. It's kind of slick and wet, not very complex or refined, but still tasty. Where some sours display cranberry without adding it, cranberry dominates here, with a sourness that becomes a little vinegary at times. Small head. A bit of a bretty smell and taste. Extremely sour. Some generic berryness but can't quite tell that it's cranberry. I have a high tolerance for sourness, but this is a bit too sour and home-brewy. Taste begins with a prettybig lacto punch, it's sour and not hiding it from anybody. Probably a touch too extreme for a novice to the style. Not a ton of fruit component of the cranberry but possess the bitter qualities of the fruit. Gives great contrast to the lacto and funk. Almost a gose-like salt character in there as well. Little undercarbed but I really didn't give this one much time in the cellar to get there. Poured into a tulip. 2013 vintage. 3.5 A: Murky orange plum color. Three fingers of fizzy beige head that falls quickly and leaves no lacing. 4.25 S: It's been a while since I've had a sour, but this is potent. Despite a couple years on this, there's still a good cranberry presence. Acetic acid forward beer with tangy lactic acid underneath. Cherry - both ripened and unripened, vinous grape, and tart apple. Pretty sweet for the style. Funkiness secondary to acetic featuring musty basement and barnyard funk. 4.25 T: Like the nose, this has big sweet fruitiness. Huge cherry in this with cranberry right behind. Vinous with apple notes. Moderately sour with tangy lactic acid. Peach, wildflowers, musty basement, dry dusty woodiness. Vanilla notes underneath. 4.5 M: Lighter medium body. Carbonation is super spritzy and appropriate in amount. Mix of refreshing with a tart finish. 4.25 D: I very much liked this. Good complexity without anything becoming too distracting. A: Pours a hazy golden apricot in color with light to moderate amounts of active visible carbonation rising slowly from the bottom of the glass and faint pink + honey highlights. The beer has a finger tall foamy white head that reduces to a couple of small patches of thin film and a medium thick ring at the edges of the glass. Minimal amounts of lacing are observed. S: Moderate to strong aromas of vinegar + oak with light to moderate aromas of tart cranberries and just a hint of citrus/lemon zest + citrus/orange zest. Overall a fairly tart/sour aroma with a subtle hint of funkiness. T: Upfront there is a light flavor of grainy malts which is quickly overtaken by moderate to strong flavors of sourness - vinegar and oak stand out in the sourness. That is followed by light flavors of citrus/lemon zest and citrus/orange zest. Finally there is a moderate flavor of tart cranberries. There is a moderate amount of puckering sourness/tartness to this beer that lingers through the finish. M: Just shy of medium bodied with moderate to heavy amounts of effervescent carbonation. Moderate to heavy amounts of acidic prickliness. O: Very tart/sour but with good cranberry fruit flavors/aromas. Not nearly as funky as I was expecting but a really enjoyable beer, though a bit more of a sipping beer. A: The beer is hazy yellow in color and has some hints of rosé hues, having a moderate to high amount of visible carbonation. It poured with a short white head that died down, leaving some wisps of lacing on the surface and a thin collar around the edge of the glass. S: Moderate aromas of sour cherries and cranberries are present in the nose. T: The taste follows the smell, having sour flavors of cranberries along with notes of oak and hints of vinegar. The beer finishes with subtle flavors of cherry and cranberry fruit that try to peek out from the underlying sourness. M: It feels light- to medium-bodied and quite tart on the palate with a moderate amount of carbonation. O: This beer is quite sour for something that is only 5% abv. It has a good balance between the sourness and fruity flavors. Pours bright copper (SRM 8-10), and is almost clear in a B-United Teku Glass. Before completely dissipating, the head is big with an off-white, pinkish froth. Little to no lace above early effervescence that quickly settles down. This beer is noisy until the head settles down. Quite sour with earthy notes and light, horse-blanket aroma. Cranberry juice is prominent with light sour-dough. Perhaps there is some over-ripe pineapple. Warmth brings out distinct oak that quickly grows to dominate the aroma. This one is very tart, similar in intensity to a Flemish Red. Acidity is similarly high. Both are relatively balanced by sweetness, while there is little to no bitterness. There is a hint of cranberry, oak is clear, but far short of what the aroma had suggested. Warmth brings out over-ripe cantaloupe. The finish is long, modest and dry, reinforcing the tartness. A silky texture and light body are punctuated by lively fine carbonation. Alcohol is surprisingly high. This one is dry with a light astringency. As an American Wild Ale, Cranberry Woods holds its own. I enjoyed it on a mild Autumn evening while listening to classical music, and imagine it would go well with a ripe brie. As an impulse purchase directly from the brewery, this proved again the value of taking chances on something odd and unusual. 750 mL bottle poured into a snifter. Pinkish red and hazy without much of a head. Nice cranberry aroma. Jammy and a bit of cherry. Musty. A bit of solvent in the taste. Sourness that gets you in the nose. Nice fruit flavor. Cranberry and cherry. Light sweetness and some oak. Medium carbonation. Pretty tasty, but a slightly off putting sourness. Cloudy orange with pinkish tinge. Alcohol booze aroma despite 5%. Good tartness. Balanced and very drinkable. 2 years' ageing helped enourmously. Cranberry Woods from Cisco Brewers Inc.